Alfred Glassell's 1,560-pound black marlin caught off Cabo Blanco, Peru on August 4, 1953 is the All-Tackle and 130-pound line class world record for the species--the ultimate achievement for every serious marlin fisherman. It has withstood early a half-century of tackle and boat improvements and hangs on the wall of the Smithsonian Institution. But Glassell was so much more than a world-record catcher. Glassell was first to boat a black marlin over 1,000 pounds according to IGFA rules and, when he lost the record a few days later, regained it for the second time in a month with a 1,090-pound catch. Film footage of his jumping, tail-walking and greyhounding granders was used in the movie version of Ernest Hemingway's The Old Man and the Sea. He spent his lifetime pursuing his passions and excelling in many fields-- including the petroleum industry, marine biology research, collecting fine art and-- unbeknownst to many-- freshwater fly fishing. He was a member of the U.S. Team in the International Tuna Cup Matches for seven years, serving as captain of the 1952 second-place team. He was a Life Trustee of Texas Children's Hospital and Chairman of the Board of the Museum of Fine Arts Houston. Glassell was a particularly generous supporter of marine science, leading successful expeditions around the world for both Yale University and the University of Miami, where a unique research laboratory bears his name. 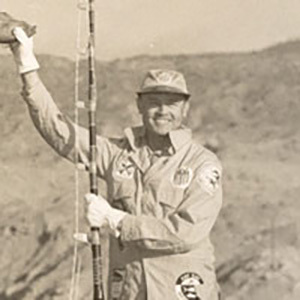 Alfred C. Glassell, Jr.-- industrialist, sportsman, adventurer, amateur oceanographer, marine biologist, philanthropist, civic leader and patron of the arts-- is an IGFA legend.